This new infrared image from NASA’s Spitzer Space Telescope and the Two Micron All Sky Survey shows IC 417, which is about 10,000 light-years away. 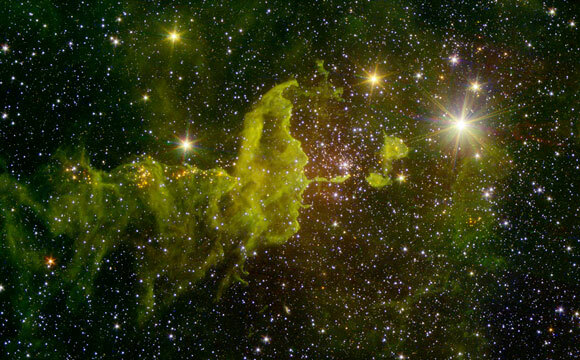 A nebula known as “the Spider” glows fluorescent green in an infrared image from NASA’s Spitzer Space Telescope and the Two Micron All Sky Survey (2MASS). The Spider, officially named IC 417, lies near a much smaller object called NGC 1931, not pictured in the image. Together, the two are called “The Spider and the Fly” nebulae. Nebulae are clouds of interstellar gas and dust where stars can form. The Spider, located about 10,000 light-years from Earth in the constellation Auriga, is clearly a site of star formation. It resides in the outer part of the Milky Way, almost exactly in the opposite direction from the galactic center. A group of students, teachers and scientists focused their attention on this region as part of the NASA/IPAC Teacher Archive Research Program (NITARP) in 2015. They worked on identifying new stars in this area. One of the largest clusters of young stars in the Spider can be seen easily in the image. Toward the right of center, against the black background of space, you can see a bright group of stars called “Stock 8.” The light from this cluster carves out a bowl in the nearby dust clouds, seen in the imageas green fluff. Along the sinuous tail in the center, and to the left, the groupings of red point sources clumped in the green are also young stars. In the image, infrared wavelengths, which are invisible to the unaided eye, have been assigned visible colors. Light with a wavelength of 1.2 microns, detected by 2MASS, is shown in blue. The Spitzer wavelengths of 3.6 and 4.5 microns are green and red, respectively. Spitzer data used to create the image were obtained during the space telescope’s “warm mission” phase, following its depletion of coolant in mid-2009. Due to its design, Spitzer remains cold enough to operate efficiently at two channels of infrared light. It is now in its 12th year of operation since launch. The 2MASS mission was a joint effort between the California Institute of Technology, Pasadena; the University of Massachusetts, Amherst; and NASA’s Jet Propulsion Laboratory, Pasadena, California. 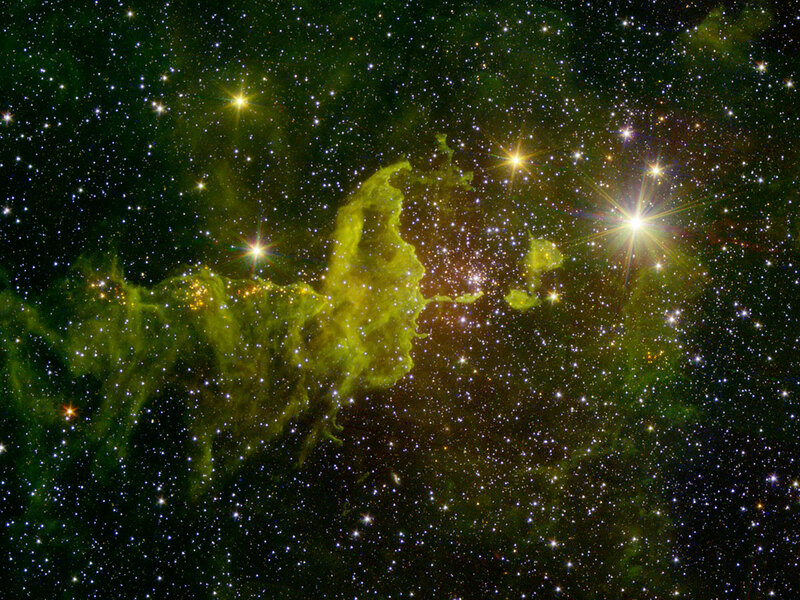 Be the first to comment on "New Spitzer Image: A Space Spider Watches Over Young Stars"